The kid got into his Easter Basket a little early - no harm in Mom getting into hers! I was inspired by a Bellini and followed the same proportions as this one for today's family holiday dinner - nice for any Sunday brunch and a change from mimosas (I'm not a mimosa girl!). It's spring! It's cherry blossom time in DC! Well, it should be but the weather has been too chilly for the tender blossoms so they're staying where they are for now and who would blame them. Still, blossoms or not - it didn't stop us on our quest to bring in the spring with a little drinkie and it ended in a little mix off. Which one do you think wins this mix off? 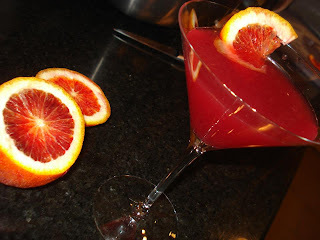 Himself riffed on a drink called Paddington which he found on Mixologist app and it was next to perfect - grapefruit juice is a favorite of ours and the color was spot on. Shake with ice and garnish with grapefruit twist. I went down a more literal route and mixed a cherry-smash-saketini type of drink and it was equally good and let's face it more original than his! 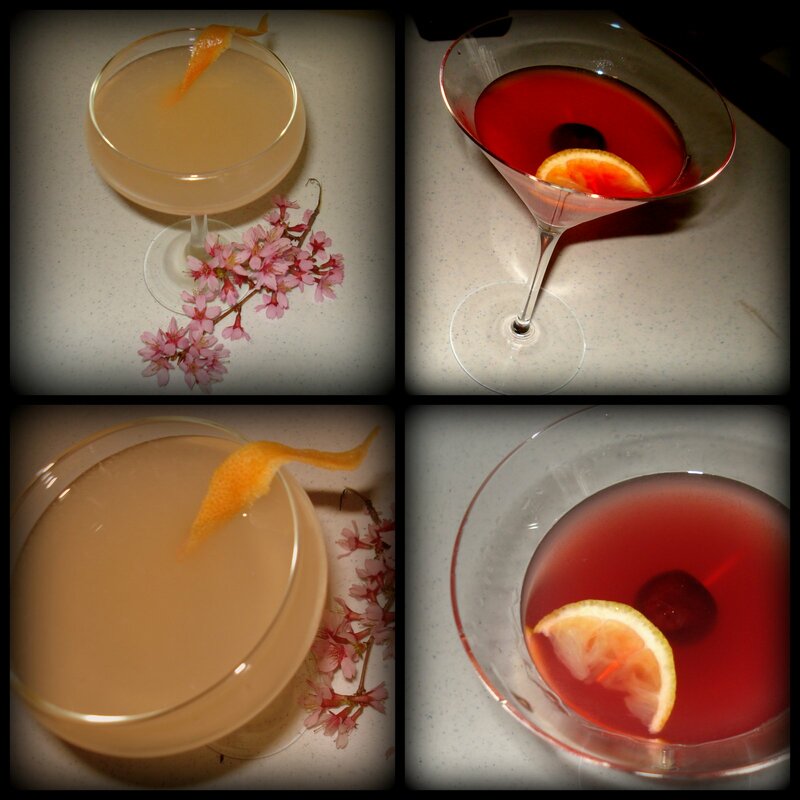 Muddle the cherries with the lemon juice and sugar, then add the gin and the chilled sake. We keep our gin in the freezer and the sake was chilled so no ice was needed for the mixing. Strain the mixture into a cocktail glass and garnish with a cherry. Here's to some cherry blossoms! Eventually. Himself picked up a bottle of Solerno Blood Orange Liqueur at the weekend (we're suckers for a good looking bottle!) and with it being his birthday yesterday I knew it had to feature in a little something something once the kid was in bed. Handily enough, we also had blood oranges in - I love these bitter sweet fruits and adore their color. Drink wasn't bad either by the way. Shake it up with ice and serve in a cocktail glass. I'm keeping it real on St. Patrick's Day - afterall, I am from Ireland. Dissolve the sugar in the coffee and add the whiskey. Heat the spoon in hot water and pour the cream slowly over the back of the spoon. 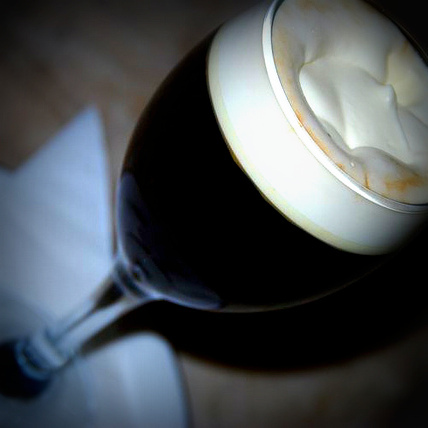 The cream is supposed to lay straight on the top and the hot whiskeyed coffee is sipped through the coolness of the cream. Thanks to social media my curiosity was piqued this week by a Shamrock Shake – I never had one of the famed beverages so can’t quite prove how this adult version compares but I can tell you I was surprised at how good it was. Really surprised! * The green kind to get the green color. If you have the clear version – add a drop of green food coloring. Shake all the ingredients together in a cocktail shaker with ice. You could always mix them in the blender but then it would be called a Shamrock Blend and that wouldn’t be quite right. * The green version to get the green color. If you have the clear version – add a few drops of green food coloring. My iPhone sucked all the green color out of the photograph. Trust me, it was green. It's March, let's get the whiskey out! Mix in shaker over ice and pour over a cherry in a cocktail glass. If Ireland was an island off Southern France this would be the perfect drink there. I made this drink over the holidays and I was getting tired of still seeing the pictures in my camera roll so I thought it was time to share it with you. And it was good too. You’d like it. I got it from My Year in Cocktails (a Christmas gift) but for the life of me I couldn’t remember what was in it apart from the rosemary and grapes which sadly are not ingredients listed in the index nor the contents drink names. When I finally found it - and it ended I had to go through each.and.every.drink (see what I do for drink you?) it was called Christmas Cheer which you will correctly assume was towards the end of the book. Remember I made it around the holidays? Yeah! I should have remembered that. Great drink but likely to erase any memory you ever had of drinking it. I recommend it obviously! Muddle the grapes at the bottom of the cocktail shaker and add the rest of the ingredients and shake well before pouring into cocktail glasses. You can strain the grapes out if you wish. Or just strain the whole drink out of your memory!